Kamowakeikazuchi-jinja is quite old; by the end of the 7th century, it already commanded consistable influence, and following the establishment of Heian-kyo, it attracted many worshippers among the aristocracy as a guardian shrine. The shrine buildings existed in their present from by the begining of the 11th century. They were reconstructed in 1628. That restoration encompassed the entire shrine precinct, and was carried out with reference to historical records, paintings and sketches, so as to faithfully reproduce the shrine as it had existed in the Heian Period. Follwing the restoration, the Honden (main shrine building) was rebuilt seven times; the latest reconstruction was in 1863 when the Gonden (associate shrine building) was rebuilt as well. 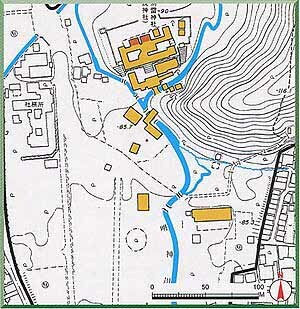 The Honden and Gonden are of the same size and shape, and are situated along east-west axis. 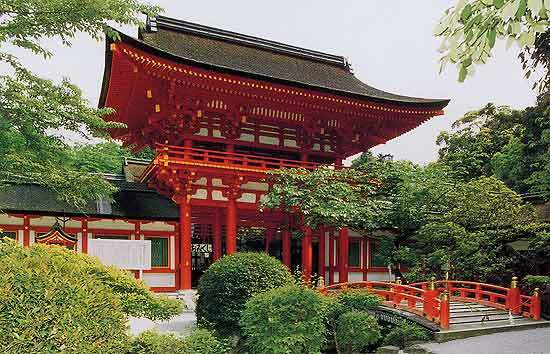 They are built in the nagare of "flowing" style, with kohai (prayer porticos) in front. The elongated front roof of nagare illustrates the ancient style of the Honden. In additon to these structures, the shrine contains the Haiden (warship hall) and 33 other shrine buildings, all believed to date from the 1628 reconstruction, and all designated as Important Cultural Properties. They preserve the atomosphere of the ancient Shinto shrines. This shrine is well-known as the setting for a variety of ritual ceremonies and festivals, including the Aoi Matsuri, one of Kyoto's "Three Major Festivals".